Would anyone have access to Bedwellty marriages and could look up the following, please? William JONES + Ann EVANS, Bedwellty 23 Dec 1872. Ann's father should be Jesse but I'd like to know William's father and any witnesses, plus occupations or anything really! Hello everyone - I've popped back to share the memoir I was privileged to help write recently. My client wanted to record the highlights of a life well lived - and what a rollercoaster it has been! It will appeal especially to Rootschatters, who are used to discovering and recording the extraordinary lives of ordinary people. Never Say Di is the true story of a girl who was bewildered by the world of adults, where she was left to her own devices and received little in the way of love. Fast forward to adulthood and Di Lofting became a pioneering nurse, had adventures on four continents and found love and friendship that surrounded her, reflecting the care she had for others. Fair warning - she was a wonderful woman - as witness the hundreds of people who attended her funeral last week. For Di - a dyslexic - wanted her book written under the shadow of cancer, to inspire and give courage to others. 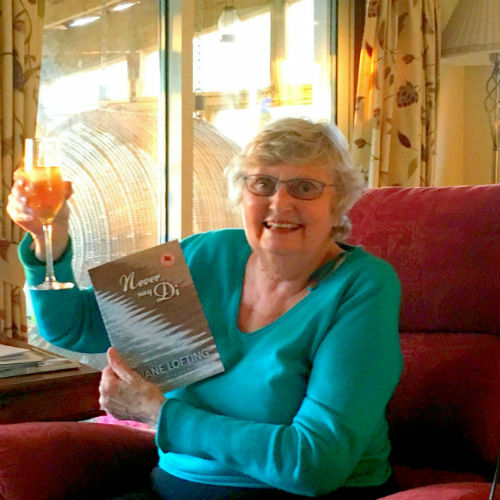 Funds raised by the e-book and softcover ALL go to Dorothy House Hospice in Bath, which supported Di in her final weeks. So far we've raised over £400 but it would be great to improve on this and enable the hospice to provide services for many more patients. Grab yourself a copy and have a jolly good read! Arthur Maurice (or Morris) MOORE died on 28th November 1892 at Henley in Arden. An inquest was held and according to the death certificate it was determined that he committed suicide while temporarily insane. I wonder whether any further details might be obtained of the inquest, which was held the same day as his death, and whether anyone can tell me how to obtain said details? Also anything in the local press or burial records - we think he was buried at Preston Bagot, where he farmed. I have Arthur Maurice (or Morris) MOORE on all censuses. He was born 1849 in Preston Bagot, Warwickshire, to a farming family and ended his years there too. His wife's name was Jane, native of Stratford on Avon. His first child Sophia was born in Worcestershire in 1872. In reverse chronological order, here's where he is found (most is just for context - the Surrey bit is the mystery). My question is - what did he do in Surrey? 1877/ 1876 children born in Croydon (Dudley Maurice MOORE - baptism not found) & Selhurst (Thomas MOORE - baptism found) respectively (census says Woolwich for latter). WHAT WERE THEY DOING THERE?? Prior to this he was with his family. What we'd like to know is why Arthur took his family to Surrey some time after 1873 until probably 1881 or earlier, and what did he do there? I'd be very grateful for any suggestions. And don't let anyone tell you that JONESes and SMITHs can't be researched! I would like to make you aware of the Festival to celebrate the 500th anniversary of the birth of Queen Katherine Parr, the surviving 6th wife of King Henry VIII, at Sudeley Castle beginning tomorrow 1st April 2012. This remarkable woman wrote books, was regent of the kingdom in Henry's absence while fighting in France and was responsible for the rapprochement between the king and his children. * Dr David Starkey says that the Church of England was essentially born at Sudeley Castle, as Katherine's was the first funeral held in English. She remains the only monarch to be entombed at a private residence in England. This is a board for resources for the English county of Gloucestershire. If you discover a resource you're welcome to post it & either lock it yourself or ask a Moderator to do it. Requests of any kind should be posted on the appropriate requests board - not here. Family History Programs, Tree Organisation, Presentation / PC to MAC - can I? Should I? When my Toshiba laptop PC broke recently (screen no longer works) I was tempted by the style of a Macbook Air and bought one. Style over substance? - we'll see!! Marvellous for my work - didn't give my family tree programme a second thought! I was running FTM2009 (I think) and have an extensive tree which I can no longer see, though it is still safely there, on the PC. Question: Should I buy FTMM2 and try to transfer my data from PC to Mac and will this likely be successful? Does anyone have any experience of doing this or are there other ideas? Are other Mac programmes better - for example Reunion seems to have much of the same functionality and would it allow me to transfer and save my data? Currently tempted to get the PC mended anyway, as it might almost be cheaper than re-purchasing the software! !